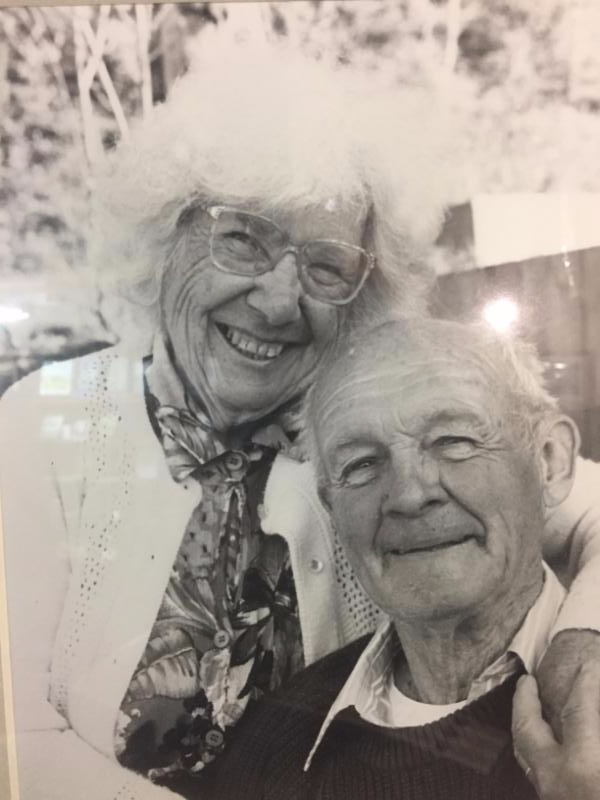 Home > News from Vermont > News from Vermont #371 Harry and Dot Continue To Inspire Us All! News from Vermont #371 Harry and Dot Continue To Inspire Us All! “Buy me a ticket on the last train home” sings Al Stewart in his song “Time Passages”. And I say “indeed, time passes all too quickly these days”. In dog years, my Black Lab Averill and I are about the same age. Yesterday Avie tried to navigate the steep stairway that leads to our business office and had to abort her attempt on step number two…yikes…how far behind am I? I can still work an eight hour day and feel like I did twenty years ago, but as my wife Betsy says, “it seems there are minutes between Mondays and Fridays now, instead of days”. That’s wicked scary! Seems as though we’re never quite prepared for it when, without warning, that fast-forward button gets pushed…reminds me of an experience we had with our dad one time after his life got set at “warp speed”. The ravages of strokes had confined him to a wheelchair and, although he had lived quite comfortably for the ten years after those strokes started, he was in pretty tough shape the day of his brother’s 70th birthday celebration. We all arrived at the Adamant Community Hall early enough to lift him up the three steep steps to the old one-room schoolhouse. Our Uncle Bernard was twelve years younger than our dad and was still in pretty good health. The hall bustled with the chatter of Bernard’s friends and neighbors, some bolstered by spirits of one kind or another. Many of us took turns at the microphone with stories about Bernard’s life, a life that demanded song and stories often humorous and off-color. Just as things were getting quite raucous, we realized that Harry Morse was being wheeled up to the mic. All of a sudden the place became “pin drop” quiet as Harry’s feeble voice cut through: “Swing low, sweet chariot, Comin’ for to carry me home”. Although our dad’s voice was weak, he could still carry a tune with the best of ’em…”A band of angels comin’ after me, Comin’ for to carry me home”. I looked around me at lots of teary-eyes and at the faces of burly men, now softened and calmed…”If you get there before I do…Tell all my friends I’m comin’ too”. It was only nine months before our dad got “carried home”. Our lives are all precious like gold, but when that fast-forward button gets pushed, the warning is served…as Robert Frost wrote, “nothing gold can stay”. Whether it’s a last train or a sweet chariot, my own fare has been paid and that’s OK. I’m still in the pre-“warp speed” stage and having a great life…so full in fact, that I intend to stay away from that man with the ticket punch as long as I can!